Axometrics President & CEO Charles Davis has the whole world in his hands – a NAITA Globe. 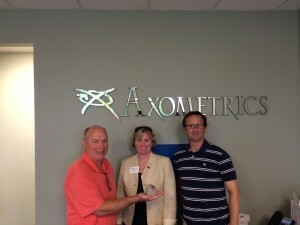 Pictured with Amanda Berkey, Sr. International Trade Specialist, Madison County Commission/NAITA, and Matthew Smith, CTO and founder, Axometrics. 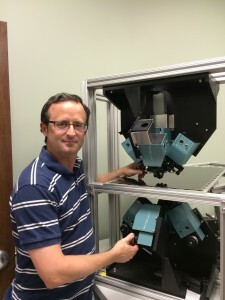 Axometrics, Inc., a Huntsville company that provides full Mueller matrix polarization testing – especially optical measurement solutions to LCD manufacturers’ production facilities and R&D laboratories – has shipped its products to other countries for 12 years. Put simply, its survival in the manufacturing industry depends on developing export markets. “Axometrics exports approximately 95 percent of all products so, without these international markets, Axometrics would not exist,” said Charles W. Davis, the company’s CEO/President. Companies like Samsung and LG use tools manufactured by Axometrics in Huntsville to assist in determining the quality of their LCD production early in the manufacturing process. Often, according to Matthew Smith, PhD (the company’s founder and Chief Technology Officer), the Axometrics precision machines are the only American tools in the giant Asian manufacturing facilities that produce the new large screen displays that are found everywhere these days. Axometrics CTO Matt Stone with prototype 3. The contribution of exports to Axometrics’ total sales has grown over the years from 50 percent to 95 percent, Davis said. The company, located in Thornton Research Park, has 16 employees, and each job is dependent on international business. Fourteen new jobs created over the last 10 years are a direct result of trade outside the U.S., Davis said. The company protects their intellectual property through several international patents. “We have two patents in place or pending in the countries we do business with,” said Davis and Smith. In all, the U.S. has free-trade pacts with 20 countries and is now negotiating additional deals with Europe and 11 countries in Asia-Pacific. Davis believes that if import tariffs are removed from Axometrics’ products in those markets, then these latest agreements would benefit the company. 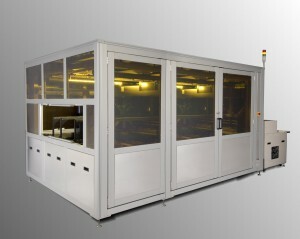 Axometrics’ AxoStep system for testing Gen 8.5 motherglass – exterior view. The Export-Import Bank (Ex-Im Bank) is the United States’ official export credit agency, and its charter is again up for reauthorization by Congress, this time with a deadline of June 30, 2015. The Ex-Im Bank promotes U.S. exports by making loans to American companies doing business abroad and insuring foreign receivables, and Axometrics has relied on the Export-Import Bank over the years. The process, precision and support offered by Axometrics distinguish them from their competition. The optical measuring tools they produce vary in size like the products they test and can be used in applications for small smart phone manufacturers to the largest of LCD TVs. Several recent large orders (in value and actual large machines) from Asian customers will keep Axometrics busy around the global clock in the near future.